$35,900 USD WOW! SO MUCH NEW! Size: 1,400 sq. ft. "m/l including site built rooms"
GORGEOUS HOME READY FOR YOUR FINISHING TOUCH! 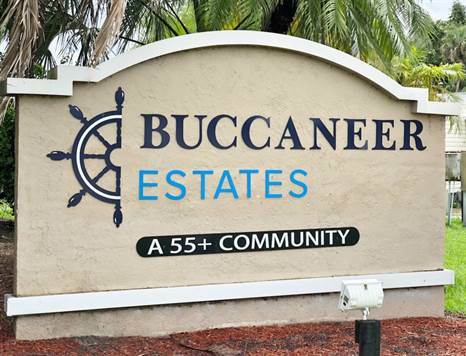 Located in friendly Buccaneer Estates this 1980 WEST is ready for you. With the sunroom and the lanai the total square footage is a right at 1,400 sq ft including the Florida room with glass windows. The open great room concept is awesome! This home will be furnished, with all major kitchen appliances, low maintenance, large carport, 2 spacious bedrooms and the master has a private bath. There is plenty of room for golf cart parking. !!BONUS!! Since the sellers bought this home in November of 2013 they have replaced the floors (sub and finish), laminate in great room, ceramic in plumbed areas, NEW raised panel interior doors, NEW custom blinds on all windows, all NEW trim casement, baseboard, chair rail, FIVE NEW ceiling fans and NEW light fixtures throughout, NEW vanities, sinks, fixtures, NEW tall boys, NEW mirrors, NEW ceramic tiled shower in master bath with NEW glass sliding doors, NEW base kitchen cabinets with NEW countertop and NEW sink with NEW fixture, NEW island for gracious entertaining with additional outlets, NEW A/C, NEW duct work, NEW 11 yards of #5 stone, timbers and planting, NEW moisture barrier with LIFETIME TRANSFERABLE WARRANTY, NEW sliding windows, A/C, and ceramic tile in Lanai, and NEW screened area with FIVE NEW custom doors. The Golf Cart and a Generator can be negotiated. Lot rent is approximately $780 and includes lawn care and use of all amenities. Other fees are pass-through tax, water, sewer and trash and add approximately $80 to monthly expenses.